The surface geology of Wiltshire follows relatively simple lines. 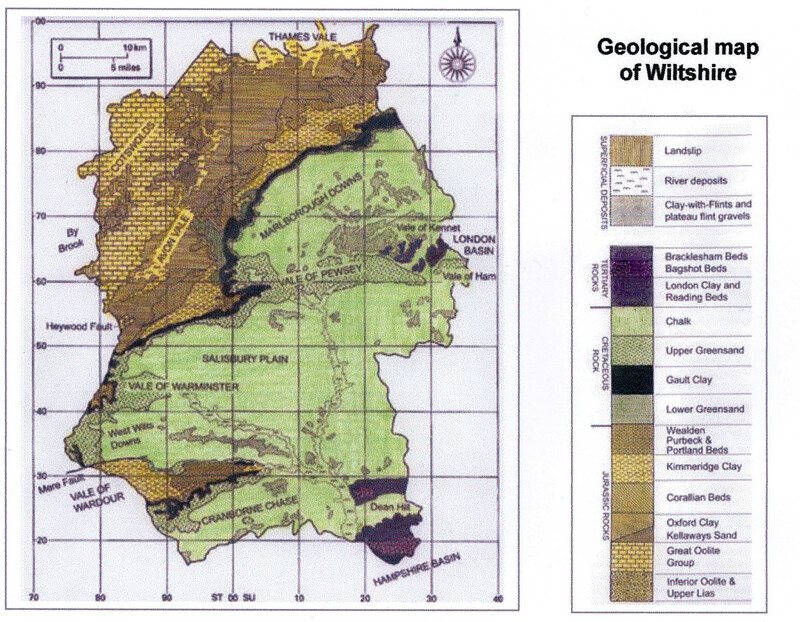 The former cover of Chalk and earlier Cretaceous rocks has been removed by erosion in the basin of the Wiltshire Avon, leaving a prominent scarp trending generally NE/SW across the centre of the County. To the north west, the Jurassic rocks crop out in succession, dipping south eastwards under the Chalk. To the south east, the Cretaceous rocks form the high ground of the Marlborough Downs and Salisbury plain. In the south east corner there are some small outcrops of Tertiary rocks at the extreme edge of the Hampshire Basin. Two major vales finger into the Chalk outcrop, the Vale of Pewsey, floored by Lower Cretaceous rocks, and the Vale of Wardour, which cuts down as far as the Upper Jurassic rocks. The diagram below shows a West-East cross-section of Wiltshire from the By Brook Valley (West) to the Vale of Ham (East). The West-East progression of outlying rock from Jurassic through Cretaceous to Tertiary periods can clearly be seen. The British Geological Survey (BGS) is now offering a free web service allowing the viewing of high-resolution geological maps, photographs and other geoscience information which can be used freely for non-commercial activities at www.bgs.ac.uk/OpenGeoscience.